I had heard that this was a must see winery if out this way. It is open from 10.30am - 4.30pm on Saturdays and Sundays. If you plan to visit several wineries on a saturday or sunday, be sure to leave this one last as its one of the only wineries in the area to be open as late as 4.30pm!! We were nicely welcomed at this winery. We got to try 5-6 wines for R10. The lady was very informative on the wines and very friendly. I enjoyed the wines here, but nothing jumped out at me. I didn't buy any wines at this winery. This is a very nice winery. The restaurant and wine tasting building is that of an old tuscany styled building. From the moment you drive up to the winery it is picturesque. On arrival, you walk up the stairs and in to the courtyard. There is a nice water fountain, and in the courtyard there are plenty of seats for guests to sit down and enjoy the selection of wines. This winery offers wines with matching chocolate. I love this touch that they have added. Sure it's a little pricy, but it's a great idea how they pair different flavoured chocolate to the wine. For example, one chocolate is salty to resemble salty food, and when paired with the red wine, it macthes nicely. I absolutely loved the Rosemary wine here. I was informed that the skins were in contact for only 2 hours, which gives the wine the slightest hint of pink colouring. I love the light pink colour this Rose` has. If it is not a nice day, there is still plenty of undercover seating and worth visiting. I highly recommend visiting this winery!! We went to this winery about 2.40pm to try make it just before they shut at 3pm. I had heard so much about this winery, mostly because of the picnic and wine tasting they offer on a boat trip down the river. I knew that we wouldn't get there in time for a boat ride, but I was determined to go there to see what this winery was all about. We got to try a few wines, and as soon as 3pm hit they let us know that they close at 3pm and our tasting ended right there. The wines were ok, but we didn't buy any to take home. The person pouring the wine for us was not very informative, but perhaps that was because it was coming to the end of the day. 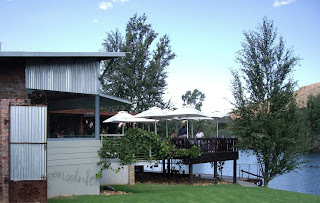 I hope to go back to this winery to do the boat cruise, eat at the restaurant and try the wines again with more time. The grounds are just stunning, the views are amazing and everything is done to perfection. This is the view from the car park of Catharina's. After we checked out Catharina's, we made our way to the wine tasting place which was at the same place as the restaurant Bistro 1682. When you walk in, there is a big round wine bar in the middle of the room. There are fantastic views from the wine tasting room. The wine tasting was surprisingly free!!! The guy serving us was just fab. He was enthusiastic, had great knowledge of the wines and was very friendly. I thoroughly enjoyed the wines on offer. I tried four of the five sauvignon blancs and rated them as following. My favourite was the Super Premium Steenberg Sauvignon Blanc 2008 (R70 on special), then the Super Premium Steenberg Sauvignon Blanc 2010 (R95), followed by the Super Premium Steenberg HMS Rattlesnake Sauvignon Blanc 2010 (R80), and last of all the Premium Klein Steenberg Sauvignon Blanc 2010 (R45). Other wines we tried were the Premium Klein Steenberg Rose 2009 (R44) which was nice, light, and easy to drink. The Super Premium Steenberg Shiraz 2008 (R125) was not heavy, not spicy and very smooth. Even though we enjoyed many of the wines, we only bought a bottle of hanepoot this time round. I am hoping to buy many more on our next visit. For the record, most people expect the Hanepoot to be very sweet, but in fact, it is not so sweet, and is a very easy drinking wine. You should definitely try it. After the tasting we met friends for lunch at the Bistro 1682. Our table had a fabulous view. There is indoor and outdoor seating, if its not too hot, be sure to sit outside, its just fab!! If it is hot, try get a table inside but near the outdoor tables (in other words you are inside, but have the views of an outside table). I love the water 'pool' feature outside, it just tops the place!! This is the view from the table we sat at. This is part of the outdoor water feature. If you come to Cape Town and can visit only one winery, make this it!!! From the tasting room, you can see the following through one window and in the next photo you can see the view through the window on the opposite side of the room. The wine tasting is free, and the service is very good. The lady at the cellar offered us four wines to try, two reds and two whites. The wine was quite nice, but did not jump out at me. The experience of coming to this winery, is worth the visit. Be sure to pop in if you are out this way. This is a nice winery, it has a beautiful set up for the wine tasting, a restaurant and a nice view of the vineyards and surrounding mountains. When you come in to the tasting room, there are oils and preserves served with crackers in the middle of the room, the wine tasting to the right and seating to the left of the room. I liked the fact that there were plenty of places to sit to enjoy the wines whether it was at a table or on a sofa, you could help yourself to the crackers and preserves, and the person serving the wines brought each one over at a relaxed pace and was very informative and friendly. I really enjoyed the wines at Rickety Bridge, but at that stage of my Western Cape wine experience, I thought the price of the wines were expensive. Since having visited many more wineries around the western cape, I now realise the prices were very reasonable. Despite the cost, we did buy three bottles of wine from this winery. We bought the Paulina's Reserve Sauvignon Blanc 2009, the Shiraz 2004, and the Paulina's Reserve Chenin Blanc 2009. We went to this winery on our way back to Worcester after having visited several wineries in Robertson. Our friend knew one of the staff and called ahead to let him know we were coming. Within a minute of arriving, we were offered a wine glass and taken out the back for a tour of the cellar. It was really interesting going through the cellar, learning about the different stages of wine making, and also getting to try the wine from several of the barrels, which were at different stages in the wine making process. I have to say, I liked the taste of the grape juice, it was sweet, and had a very zesty but refreshing taste to it. After the cellar tour we went in to the tasting room to try the wines. I enjoyed quite a few of the wines. Some of these included the balance natural sweet rose which is sweet and easy to drink, the balance pinotage/shiraz which was nice, simple and smooth, the Vin Sec (dry) which is a sparkling wine, not very dry and is easy to drink. After the tasting we bought quite a few bottles to take home. The price of the wine is very reasonable. You've got to love Worcester wine prices!! !The wines range in price from as little as R25 for the Balance wines and don't go any higher than R60 for the soulo wines. There is a huge range of wines to taste at this winery, the staff are very friendly and informative. If you plan to do a tasting in Worcester then I would recommend trying the wines at Overhex. This is a nice winery. My friend and I went to the restaurant Cassia for lunch on a monday. The setting is very nice and relaxing. While sitting outside you look over a big pond. The service was fantastic. We tried two different white wines, the sauvignon blanc and semillon. We enjoyed both wines, however, both preferred the semillon over the sauvignon blanc and found it went very nicely with our meal. The food was very nice and presentation of the food was also good. My friend had the pork belly and I had the chicken leg. Both were absolutely delicious. I would definitely go back to this restaurant for a lunch again. Since having the lunch, I have been back for a wine tasting, which was an even greater experience. We were lucky to be served by a very passionate and highly informed Nitida staff member. The Sauvignon Blanc 2010 is very easy to drink, the lime, tropical grassy flavours are fab!!! For R75 this wine is a steal. The Semillon has a crisp, fresh, smooth, great taste, with spicy, grassy smells. This is also sold for R75. Chardonnay's are not my favourite white wine at all. Yet Nitida's Chardonnay (R75) was great!! It is sweet, smooth, and tastes great. You should definitely try this wine, even if you aren't a chardonnay fan. Cab sauv was also delicious, it was easy to drink and smooth. The Nitida Club Select was also great with its grassy and mineral smells, it is light, crisp, and had a great taste. Overall, I loved the wines here at Nitida and would love to see their wines more available in restaurants. Be sure to visit this winery for the wine tasting and food. This winery has a smaller production level of wines compared to some of the neighbouring wineries and therefore provides a more personal touch to its wines and winery, it has fabulous wines and great food at the restaurants. Check this winery out if you are on this wine route and look out for Nitida wines at local restaurants!!! You can pretty much make no mistake in ordering a bottle of Nitida wine. I love this winery!!! It is now one of my three favourite wineries. One lady at another winery had warned us that we may not be able to do a tasting at La Vierge because they are often closed for weddings on the weekends. It turns out they were setting up for a wedding, but they were still allowing customers to have lunch and wine tastings on the balcony. The following photo is the inside of the restaurant, which was set up for a wedding. This would be a fantastic place to have a wedding, and recently in the newspaper they were advertising that if you have your wedding at La Vierge in June or July that the venue fee will be free. I tried an entree at this restaurant and it was absolutely delicious!! I would love to go again to have a three course meal at this restaurant. This restaurant is a bit pricy but if you are willing to treat yourself, then this is a nice place to do just that. I enjoyed most of the wines we tried, I definitely recommend you go to La Vierge for a wine tasting. I am not much of a chardonnay fan, but I absolutely loved the Domaine Des Dieux Chardonnay 2009. The taste of this wine just blew me away, I just loved its uniqueness and difference to most chardonnays. This wine is quite pricy, but I feel it is worth it. The price of this wine is R120 per bottle. I don't recommend trying the reisling. I didn't think it was very good, espcially in comparison to Australian reislings. If you do want to try the reisling, let it sit for 5 mins first. I found this improved the taste of the wine considerably. Be sure to visit this winery if you are in the area!!! I will definitely be going back for a second visit!!! Laborie is also on the main road of Paarl. There is a nice setting at this winery. At the end of the drive way, there is a restaurant to the left and the cellar door to the right. There is indoor and outdoor seating for one to sit down and enjoy the wines. It costs R15 to taste five wines, R25 for eight wines and you still have to pay this fee even if you buy wine (some wineries do not charge you for tasting if you buy a bottle of wine). Laborie has a brandy which won best brandy in the world award in 2010. I am not a fan of brandy, but this was actually very nice, smooth and pleasant to drink. This brandy sells for as little as R126 a bottle. Also worthwhile trying is the Jean Taillefert 2006 (R151) and the Ltd Shiraz 2008 (R67). We went to KWV for a wine tasting. There is a huge amount of wines available to try, including sparkling wines, white wines, red wines, brandy, and fortified wines. If you are a big group, there should be something here for everyone. The service at KWV was very good. There are several tables to allow guests to sit down, choose which wines they would like to try, and then have the wine brought to you to try. There are many wines I liked. However, if you are looking for something a bit different, be sure to try the Cafe Culture Pinotage. This is a mocha red wine. I loved the coffee smell it has, the smoothness of the wine, and the taste. This wine is a little dry. If you like Port, be sure to try the KWV Cape Ruby. It has a great taste: slightly dry aftertaste and yet sweet. If you are passing by KWV and have time, be sure to pop in and try their wines. Juno is on the main road of Paarl. It is a cute cafe where you can have something to eat as well as do a wine tasting. You can sit outside at the front or back, or sit inside. I had a club sandwich for lunch, which was absolutely fantastic!! The sandwich was huge and the price was very reasonable. We did a wine tasting also. We enjoyed the malbec there. It was on sale for only R20 when we were there. Its a very smooth, easy to drink wine. We bought several chenin blancs as these were also on special and a nice quaffing wine.